Looking for the best Excavator Rental company in Western New York? The fastest delivery, most reliable equipment, best prices & expert advice from the Duke Company. Call 585-292-9870 (Rochester NY) and 607-347-4455 (Ithaca NY). The Duke Company rents a complete range of full-size excavators, compact excavators and attachments including hydraulic breakers, hammers, grapples, augers and more. Our equipment rental inventory includes both minimal tail swing excavators and zero-tail swing excavators. Whether you are looking to conquer the biggest excavator job, or work in tight spaces, our full-size excavators and mini-excavators are equipped to do the job. 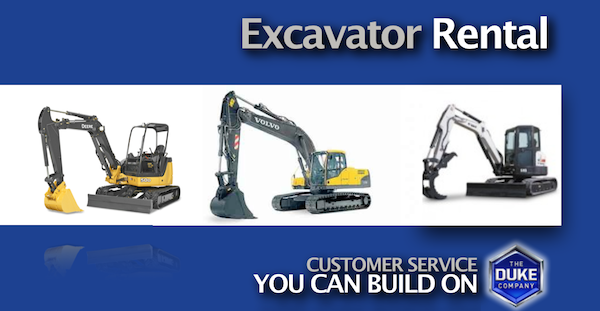 In addition to the best brand name excavators from Bobcat, John Deere, Komatsu and Volvo Construction Equipment, the Duke Company provides you with Customer Service that You Can Build On. We have proudly earned a reputation for integrity, exceptional service, and the fastest delivery & pick-up in Western NY. Whether you are looking to rent excavators by the day, week or month, call us for an accurate price quote including delivery. Our competitive prices are supported with the best service in Syracuse, Buffalo, Binghamton and beyond. The Duke Companys professional delivery trucks work the hardest to delivery & pick-up rental excavators to your job site – whether industrial, commercial or residential. The Duke Company carries one of Western NY’s largest selections of professional building supplies from pro-grade vendors including Conproco, Dow, Increte, Hohmann & Barnard (HB), Hanes Geo and more. For exceptional service, call The Duke Company at 585-292-9870 (Rochester NY) and 607-347-4455 (Ithaca NY).